Astbury Formentera are specialists in organising holidays to Formentera, and have successfully been doing so for 36 years. Formentera is a beautiful and unspoiled island in the Mediterranean where visitors are welcomed with a warm embrace and can enjoy a relaxing atmosphere. Astbury Formentera organise accommodation and holidays, villas and apartments to Formentera. A beautiful and unspoiled island in the Mediterranean. 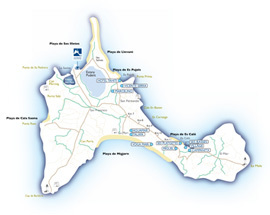 We carefully select some of the best quality accommodation in Formentera. This includes luxury villas, houses, bungalows, apartments, studios and hotels.